After deeper investigation I came to realize that the Skinny Dipper is more than just the next bait in a long list of popular chuck and wind predecessors. Which include in more recent years the Zoom Horny toad, Z-man Original Chatterbait, and Basstrix Paddle Tail Swimbaits. This bait looks good when worked on top like a frog, or waked just under the surface, and can emulate another Florida bass angling staple, the Zoom fluke. Its ability to glide and be worked in much the same manner as a stick bait lends to its overall versatility. After taking this bait out on the water and satiating my initial curiosity I pinpointed a number of factors that make this bait the latest “craze”. 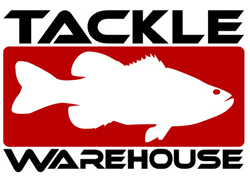 Much like the chatterbait, nationally televised footage of FLW series pro Jimmy McMillan fishing the bait and catching some big bass doest hurt. Neither does press regarding Kevin Longs Okeechobee Stren series win on the bait or press of local co angler Larry Mullikin crediting both his 09 FLW Series and Stren Series win to the bait. Word of mouth goes a long way in this sport and this bait is no exception to that rule. 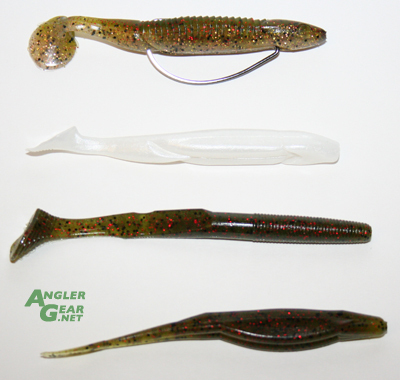 Unlike a few other prominent swimbaits on the market this bait can be considered the “poor mans” alternative. For those just getting into the whole swimbait craze, or those seeking an alternative option, this bait fits the bill perfectly. At around $5 for a pack of 7 anglers can afford to purchase multiple colors in quantity and build a nice stockpile like other soft plastics. The sub 5” size of the standard Skinny Dipper has a healthy profile but isn’t overpowering for use on standard bass tackle. Like other salt impregnated plastics this bait can be cast a country mile. Also, much like other popular soft plastics this bait comes in a myriad of colors, with the Houdini (watermelon red/gold flake) being the most popular at the moment for its tournament win status. The standard dipper has an approximate weight of 12g and has the drawing characteristics of multiple baits. These soft plastics can be worked like a typical swim bait over weedy areas, cast to targets like a spinnerbait, jigged on the bottom, jerked like a rip bait, skipped like a tube under docks and overhangs, flipped like a beaver, act a trailer on a swim jig, and towed behind a Carolina rig. Skinny Dippers can be rigged weedless (pretty much a mandatory requirement around these parts) by simply using a typical EWG superline hook or weighted hook. A popular option is to utilize a 1/16 or 1/32 screw in weight, or Reaction Innovations own Screwed-Up Bullet head. Given that this bait is solid plastic, it is usually good for more than one fish and that’s always a plus when the bite is on. This should be a given, yet for so many lures out there that look good on paper or in the package they just don’t deliver the goods on the water. I can honestly say that this bait is a performer and brings in numbers as well as quality. I find that certain colors have a little bit more of that “X” factor when it comes to the way they come through the water. For instance, although “Houdini” may be all the rage right now I’m finding myself impartial to the “white trash” color at the moment in the stained bodies of water I fish. Regardless of what color you choose I’m sure you will see fantastic results as I have. 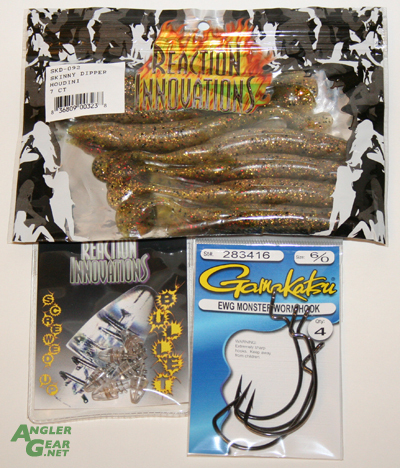 All in all, the Reaction Innovations Skinny Dipper has the makings of not only being the next “fad” lure but rather a useful staple in the arsenal of bass anglers everywhere. The “hot” color Houdini as well as typical rigging options.